Strong marketing is the difference between a thriving business and one that’s struggling to make ends meet. Just knowing where to start is a daunting task, especially when you face the full-time challenge of running your business. But modern companies can no longer take online marketing lightly. Your business success depends on your ability to connect to your audience online. Here are five things you can do right now to better understand key marketing components and improve your results. Tip 1: Getting Found Online: What does your website look like to search engines? Search Engine Optimization, or SEO, is mandatory if you want to win at online marketing. Getting the search engines to drive people to your website is a constantly shifting puzzle. Before you can write, create, or fix anything, you need to know what the search engines “see” when it comes to your website. Go to google.com and type in “site:YOURURL.com” (or .edu, .biz, .org, etc.) 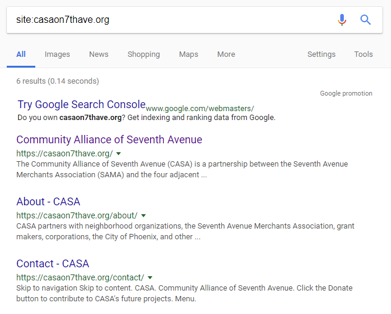 to see all of the pages Google knows about on your website. The page descriptions are the black text below the title tag and URL (in green). Read through the descriptions to make sure they only include helpful information. For instance, in the example above, the description for the Contact page is a mess. We’ll help you fix your descriptions in Tip #2. Maybe you’ve heard of keywords before; keywords are the words and phrases that people would type into a search engine to find you. Prominently featuring the right keywords in the right spots on your website is how you signal to Google what words or phrases you should show up for. A little keyword research goes a long way. 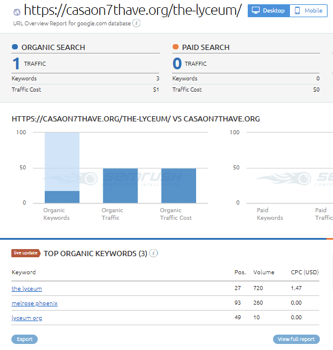 Start by going to semrush.com and sign up for your 10 free searches. Then you just have to enter your website’s URL for analysis. This handy tool will display your current keywords, what keywords your competitors are using, and whether your keywords are in your titles and descriptions (which they should be). Spend a little time examining your keywords. Are they the search terms your target audience is likely to use when looking for your business? Or do you need to make some tweaks to your keywords? If your website is built in WordPress, we recommend you use the free Yoast plugin to help you understand where your keywords need work. Yoast will show you how well your page is doing to show for the keywords you want it to show. For other platforms, use the SEO tools your website offers. Google My Business is a free service that Google offers, and it is the cornerstone of the accurate name, address, and phone number of your business. It’s imperative that you claim the listing and take control of what it says, because all other references to your business on the internet will be compared to your GMB listing for accuracy. Ideally, the information from your Google My Business listing will be consistent across the internet. This is the equivalent of having the right information listed in the phone book. To create your account, simply navigate to business.google.com and enter your company’s contact information. This includes your company name, address, type of organization, phone number, and website URL. Google will ask if you want to verify your account. It’s worth the hassle to go through the verification process. They may want to mail you a postcard or call the business phone number to verify that you are really in control of the business. 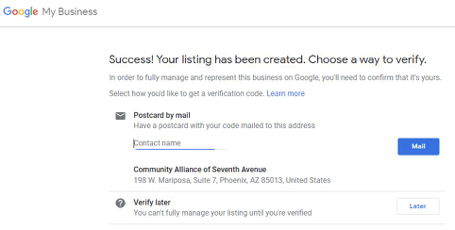 It’s important that once you start this process, you follow through on using the post card or phone call to verify your GMB listing. At that point, you will have complete control over your Google My Business listing. The last step is to check your social media channels, review sites, and any directories where your business is mentioned and correct any errors with your contact information so that it exactly matches what’s in your Google My Business profile. Search engines gain confidence about your business information via the quantity and quality of matching references from all the various directories and other sources. Your ability to show up, even when people search for you by name, is influenced significantly by consistent accurate information found on the internet. So make sure all of the Name, Address, and Phone Number listings for your business are consistent with your GMB. An email list of past and current clients, and hopefully leads, is one of the most important assets a business can have. It enables you to leverage everything you do. Sometimes, all you have to do is ask your website visitors to share their email addresses with you. But it often helps to give your audience something in exchange for their emails. Nowadays, people guard their email addresses quite closely. You’ll need to give them valuable information if you expect them to trust you with their email address. This is where a free report or white paper comes in handy. With an email list, you can communicate directly with your audience whenever you want. You will convert more leads and drive referrals faster than you would without those emails. MailChimp is a fairly robust email marketing tool that’s free, unless you have more than 2,000 emails in your list or you send more than 12,000 emails per month. You will get free reports, A/B testing, email templates, social media tools, custom sign-up forms, and many other goodies, even with a free account. So when you’re just getting started with email marketing, MailChimp makes a lot of sense. Reviews are today’s word of mouth marketing. A lack of reviews is like an empty restaurant. Don’t be afraid to ask your happy customers to leave positive reviews for you. Pick one or two review sites to focus on. Yelp, Facebook, and Google are probably the three most popular places people check when looking for advice about companies of all kinds. Collecting five-star ratings and glowing reviews shows potential customers that it’s a good idea to do business with you. Responding to your customers’ reviews shows you are engaged and concerned about what people are saying. Dealing with negative reviews can be painful, but it’s probably even more important than thanking people for good reviews. Address complaints with patience and tact. Request more details so you can get a clear picture of what went wrong. Accept responsibility and apologize. Last but not least, always ask the person for a chance to make it right. We have a system we use with our clients to help them collect more reviews, and try to filter out negative reviews before they go public. If you’d like more information on that, drop us a note and we’d be happy to show it to you. Want to Know Exactly Where You Stand on Each of These Key Tactics? Hopefully, we’ve helped you gain some insight into these key components of a solid marketing foundation. If you’d like some help understanding them at a deeper level, we can run reports for you that go into much more detail on these (and a few other) topics. We run these free for interested parties, then schedule a brief call to explain the results. No obligation whatsoever. The insight you gain from our reports is yours to do with as you wish. But if you want help kick-starting your online marketing strategy, we will be happy to help you leverage your data to increase your traffic, conversions, and sales. Go Here to Request These Valuable Free Reports! Client Rush Marketing specializes in helping small businesses in the Phoenix and Seattle areas to get more leads, clients, patients and customers.